Hillary Chybinski: it's christmas eve. . .
it's christmas eve. . .
. . .gonna relax. . .turned down all of my invites. . .
here we are. 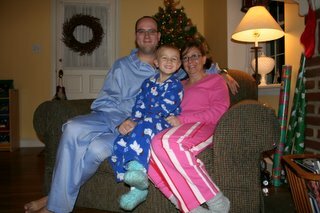 all in our new christmas jammies, ready to settle in and watch some christmas specials before we head off to bed to wait for santa. . .well, some of us have some putting together and some wrapping to do still. . .